Afghan Weddings - an unforgettable experience! While the Qur’an states that weddings should be conducted within the financial means of the family, it is not the usual custom in Afghanistan. Many Muslim men marry relatively older in life, saving for years to be able to afford the engagement and wedding requirements. Afghan Weddings: The Process of Engagement and Ceremony. In Afghanistan, there are many religions and different ideas and different thinking about women's rights even regarding wedding customs. Typically, the women of the family will see a young woman they like, and suggest that to the husband/family as a choice for the son. Then, a close friend/brother helps arrange the engagement/marriage contract – someone who will be living if the marriage does not go well and can help out. Then the men get together and agree, and the engagement party is scheduled. This could take up to a year. When a family wants to engage their son, the women of the family try to participate in parties with other families. After they find someone of their choice, they learn about her family background to see how suitable the family is. They'll learn where she lives, if she has worked somewhere they'll ask her co- workers or classmates about her and then they will make a decision. They will travel to her house and hopefully she will be the one to prepare the tea and refreshments for the first time. The family of the boy won’t say anything- they will just observe her. Later, they will make a second visit to the girl's family, and they will tell them about their son and will request the girl's family consider their son. Her family will ask them for some time to think about it they will also look and ask about the boy’s background. When the both sides decide on a agreement her family will bring a piece of candy to the groom's family. The candy means they are in agreement and are happy with this process. Some families may even allow the boy to talk with the girl before any formal agreement is reached, and he may ask her directly if she is happy with what both sides are deciding. After the agreement is reached, both sides will plan a day for the Sher-E-Ne Khore Party. The Sher-e-ne Khore party should be paid for by the bride’s family. Depending upon how much money her family has, they may celebrate at a hotel. If they do not have much, they will celebrate at her home. The bride wears a full length elaborate green dress for this party. Most of the westernized Afghan families will receive money for their daughter, like at least 200,00 Afs to 500,00 afs or even up to 700,000. They will make this clear before they bring a small candy at the early stage of engagement. The couple will be engaged for one month to know each other well, to be familiar and to understand each other's behaviors. After this period of time both side men and women will plan a day for the wedding, which should be celebrated in a hotel from the boy’s family and the bride should wear white dress and the boy should wear black suite. 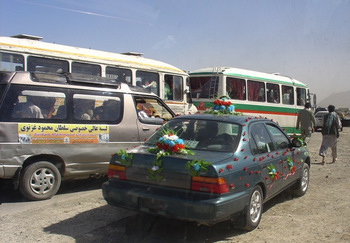 Weddings are elaborate affairs in Afghanistan. Even poor families will go in to debt, spending close to $20,000 for the clothes, the wedding hall, the food, singers, flowers, and photography. It is increasingly in vogue to deliver fancy wedding invitations, but unlike the six-weeks before-the-date rule in the West, wedding guests in Afghanistan may not receive their invitation to the affair until 1-2 days before the event. Two newer customs making their way from the West: silver and diamond solitaire engagement rings and videography. Many a wealthy prospective groom in Kabul, Afghanistan is now presenting a Western engagement ring to his bride. Men who can afford it are wearing gold or silver wedding bands. Videography at Afghan Weddings is increasingly more elaborate, showing a video of the bride once she is dressed, and following her and the groom all the way on their journey to the wedding hall where the guests are waiting. Islam does not allow for alcohol and mixed dancing at weddings. Usually, women dance on the women’s side, and men dance on the men’s side. The bride and groom will usually sit down on the women’s side, and not even appear to the male guests. 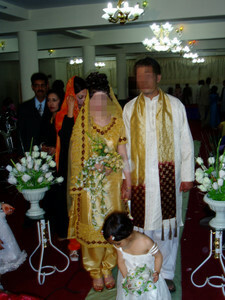 A bride wears some shade of purple at her engagement party, a requirement in most Islamic cultures – although this should be seen as a culture rule, not an Islamic rule. She may wear a green wedding dress as well as a white wedding dress. The wedding requires usually two dresses – first, the Islamic green wedding dress and then the fairytale-esque white wedding dress. Wealthier brides may have even more changes during her wedding gala to an evening gown. Typically, a chicken or a sheep will be sacrificed near the bride on her wedding day by a close male relative of the groom. Then a brother, uncle, or father of the groom will smear some blood in the bride's shoe. The ceremony signifies three things: (1)The bride now belongs to the groom's family; (2)She is now clean of evil spirits she may be bringing into the family; (3) She is pure. It is amazing this redemptive analogy internal to the wedding customs! Girls may be married in the villages as young as age 8, but not consummated until later when she reaches puberty (if she is lucky). 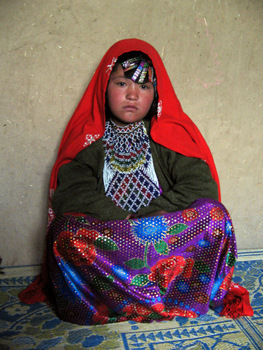 Below is a picture of a child bride. 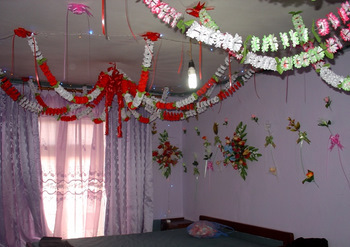 Afghan weddings which take place in the village will occur in the groom's home. The men will dance and eat and celebrate together. The legal aspect of the marriage will occur without the bride present. The women will gather at the bride's home, where there will be lots of women and girls hanging out to gossip, fix makeup and hair, and generally be involved in the excitement of the wedding. The men and women will stay separated during the entire affair, until the moment the groom goes to retrieve his bride and bring her to his house. Both in the city and the village, the car used for this purpose will be elaborately decorated. In strict Islamic cultures such as found in tribal groups, it is imperative a bride never smile during the entire Afghan wedding event. The reason for this stems from the cultural value of honor - the women of the family bring honor or shame on the family. For a bride to smile in public will cause her father to lose honor. Her happiness must be contained or people will think she is happy to leave her father's house. Afghan weddings are happy, loud affairs, definitely a fun cross-cultural experience for outsiders to experience. Watching the women gossip, check each other out, and dance with abandon for an evening is a joy not to miss! I may come to live there - what do I need to know?